Single-Speed - a basic coaster-brake hub. Today, there is a bewildering variety of internally-geared hubs on the market. Sometimes it's hard to chose which one would be most suitable. If you don't want to make modifications to your frame, then go for a hub with a narrower over-locknut-dimension of 120mm or less. Anything wider will require having the rear triangle of the frame spread apart. In researching for this page, I found that there were more than a dozen options out there for people who wanted internally-geared-hubs. So, why an internally-geared hub? There are several benefits. Less wearing parts means reduce long-term maintenance costs because there are less part to replace. There is reduced maintenance requirements, and less parts to clean. It is almost impossible to throw the chain off the sprockets. You can shift gears whilst stationary - this is the big selling point, especially for people who have to ride in stop-start traffic a lot. These are excellent top-of-the-range internally-geared hubs, but their wide over-locknut-dimension makes them unsuitable for an unmodified Raleigh Twenty Frame. Both hubs have proven to be quite popular on touring bicycles and would be the ultimate geared-hubs if you are prepared to have your frame's rear triangle spread specifically to fit them. Perhaps the ultimate in epicyclic hubs available today - also the singularly most expensive. I would not leave a Rohloff-equipped bicycle outside for long. Only available drilled for 32-spokes. Over-Locknut-Dimension is too big for a Raleigh Twenty frame without spreading the rear triangle. The 409% gear range will make it possible to gear a bicycle either as a tourer or a city bicycle. It is possible to get a very good spread. It is about double the price of Shimano's 8-speed hubs. It seems that Shimano used gear ratios which best suit 20" wheels, as a 44t chainring and 18t sprocket produce an excellent touring range of gears of approximately 23 to 94 gear inches. These 5 and 8-speed hubs provide a nice wide range for general-purpose riding. Perhaps not ideal for fully-loaded touring (ie where you carry everything including the kitchen sink! ), but still a good range of gears for commuter and some loaded touring use. Unique in that gear 1 is direct drive and all other gears are step-ups. It is more difficult to get the super-low gears for touring/load carrying but not impossible. To get low touring gears, you would need to get a fairly small chainwheel and/or the larger sprocket available for this hub. Like the new (post-2013) 5-speed hubs, there are drum, disc and coaster brake versions, but these all have a larger OLD 132-135mm which make them unsuitable for the Raleigh Twenty without frame modifications. If you want an 8-speed hub, you must be prepared to use the freewheel version and make provision for rim brakes, otherwise have the rear triangle spread to take the wider hubs. The X-RF8 comes in a long (185mm) and a short (175mm) axle version. The latter type has an OLD of 120mm, but has an extra (redundant) locknut which when removed reduces the OLD to 115mm. 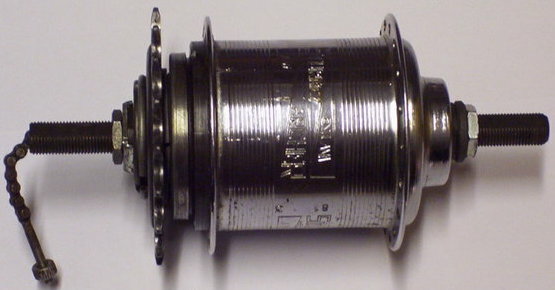 Sheldon Brown used one of these hubs on his Raleigh Twenty. Sheldon's set-up is probably the best arrangement for this hub. He took advantage of the 6 close-spaced gears for most riding with the extra low first-gear as the hill-climbing "bail out" gear and the top "downhill" gear for fast descents since he was against coasting downhill. 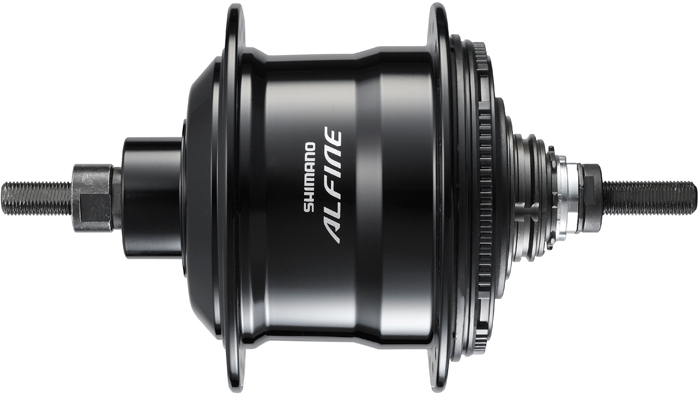 Shimano makes two lines of 8-speed hub, the Nexus and Alfine. The former is supposed to be the general-purpose range and the latter the more performance style, but in practice there seems to be little difference in quality between the two. In some ways they are perhaps the ideal hub for a Raleigh Twenty upgrade. Overall, the price of this hub makes it an attractive upgrade. You can fit either a 16 or 18-tooth sprocket. The difference is basically whether you want an extra top gear for flat areas or an extra bottom gear for hill-climbing. Of course, the 130mm OLD means spreading the rear triangle. Available in freewheel, disc and roller-brake versions. A personal note here is that I'm not fond of the Shimano roller-brakes. They have some sort of bicycle equivalent of ABS, which is meant to prevent the rider from locking up the wheels, but rather disconcertingly means that if you grip harder, the brakes actually slacken off. For a slow-speed beginner rider this might not be an issue, but I am used to the feedback feel that you get from a standard rim or hub brake. From 2009-2012 there was a selection of 5-speed wide-ratio hubs, essentially like a standard 3-speed with an extra gear above and below. These do not seem to have been popular and were discontinued at the end of 2012. The *new* 5-speed hubs from 2013 have four gear jumps, equally-spaced at 25%, making them similar to the FW 4-speed hub with an extra gear on top, like the original Sturmey-Archer 5-speed hubs. There are the usual options for a drum brake, coaster brake and disc brake, but these all require a rear spacing of 135mm. The only one really suitable for the Raleigh Twenty with the narrow rear spacing is the RX-RF5 freewheel model. This has an extra locknut on the non-drive side which can be removed, bringing the OLD down to a more manageable 120~122mm, which is a "spring-fit" into a Raleigh Twenty's rear triangle. 3-speeds was the standard for much of the history of the geared epicyclic hub. However, not all 3-speed hubs are the same! SRAM and Shimano's 3-speed offerings have a slightly wider gear range than the traditional Sturmey-Archer ratios. Some cyclists love them, most do not notice any difference but I don't. I'm far too used to the 33% gear jumps of the Sturmey-Archer 3-speed and the slightly wider shifts of the other brands "feel wrong" to me. At the end of the day, I've found that a 3-speed hub with a sensible set of gear ratios is good for most general-purpose cycling, and I've happily ridden many miles on old AW hubs and more recently on an SRC3. A slightly-wider-ranged 3-speed hub. SRAM offers several types with different braking options. Slightly wider gear range than Sturmey-Archer, and has a very good modern coaster-brake option. Many would say that this is the original and the best. AW hubs will go on just about forever as long as you regularly oil them. (One small squirt of oil every month seems to be plenty, but refer to current service manuals to be certain). According to cycling folk-lore, AW stands for "Always Works." 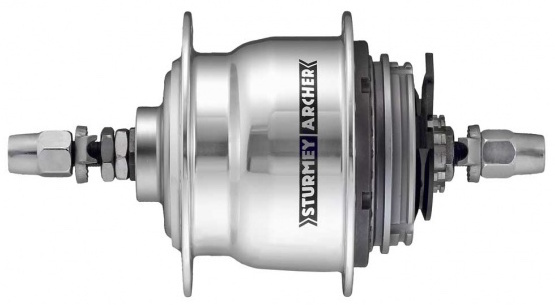 Sturmey-Archer also make a more modern line of 3-speed hubs with alloy shells, better seals and have a variety of options such as trigger, lever, barcon, and grip-shifters. 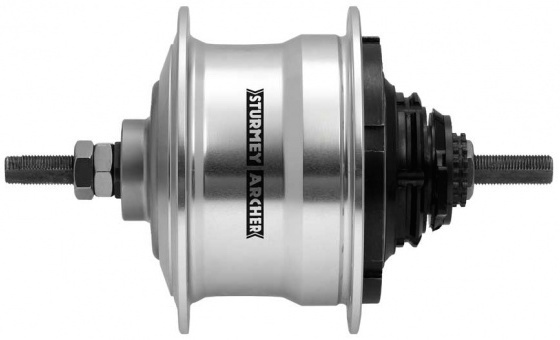 Sturmey-Archer now offer various models which include coaster brake or drum-brake options. There are several different over-locknut dimensions, depending on which particular model you use. Notable hubs are the XRD3 (70mm Drum Brake) the SRC3 (coaster brake) which are available in short-axle versions with a smaller over-locknut dimension which makes them suitable for the narrow Raleigh Twenty rear triangle. A modern version of the Fitchel and Sachs 2-speed Duomatic hub. This one shifts by a small kick-back, so requires no other control equipment. It comes in both freewheel and coaster-braked versions with the same kick-back shifting. The S2C is spaced at 116mm and the S2 is at 120mm. 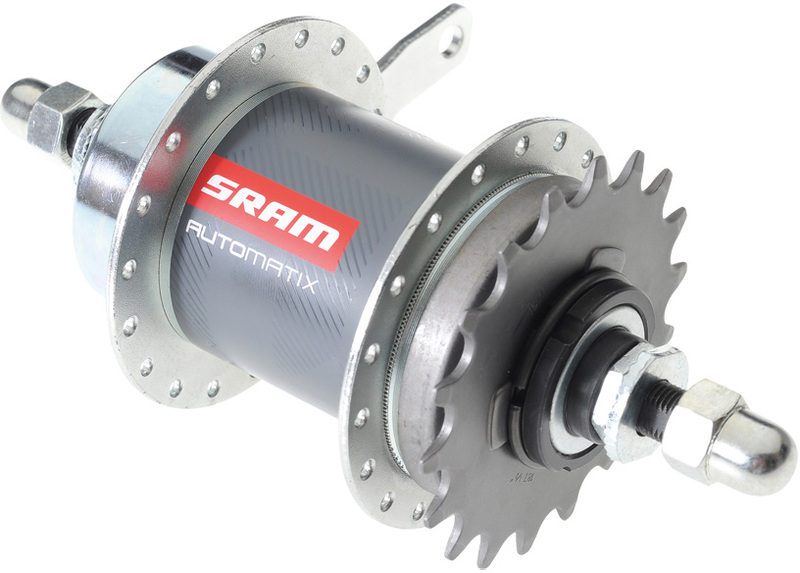 Not to be outdone by Sturmey-Archer, SRAM has released the 2-speed AUTOMATIC hub. This hub will automaticallt shift from low to high gear at a pre-set speed, utilising the centifugal forces of the spinning hub. Available both as coaster and freewheel versions. The hub is spaced at 120mm, but also comes supplied with spacers for 130mm. An advantage of either of these 2-speed hubs is that it is possible to only need a single cable from the front brake - clean lines, no shifter or rear brake cable - the hub shifts for you and you pedal backwards for the brake! A similar spread of gears as most 18-speed MTBs. An excellent choice for utility trips, but relatively expensive compared to the two 8-speed hubs available. 135mm over-locknut-dimension means that you will need to have the rear triangle spread to suit. These hubs are discontinued. Available in freewheel, coaster-brake and drum-brake versions, this is another good choice for the Raleigh Twenty. The Over-Locknut-Dimension of this range varies from of 132-135mm, which means that you will need to have the rear triangle spread to suit. These hubs are discontinued. There are also several models of 4,5,6 and 7 speed hubs from various manufacturers which are all discontinued.